For most of us, the onset of fall means beginning the hunt for your new pair of perfect jeans. With a small waist and curvy hips, it sounds like you’re an hourglass shape. Keep your (seriously envied) shape top of mind as you hunt for a new pair of jeans and get ready to show off your shape with jeans that fit. Stretch denim is your friend: Skip the stiff denim and go for jeans with plenty of stretch. Your perfect jeans should have at least 2% elastane in the construction. Highlight your waistline: Higher waistlines (on all your bottoms) are an hourglass shapes secret weapon. If you consider yourself curvy, look for bottoms with a contoured waistband that has a higher rise in the back. Don’t shy away from slim silhouettes: We’re setting the record straight—you can wear skinny jeans. Grab a pair with the perfect inseam for your figure to avoid bunching at the ankles. Here are the best jeans for an hourglass shape! If you don’t love high rise denim, get ready to! 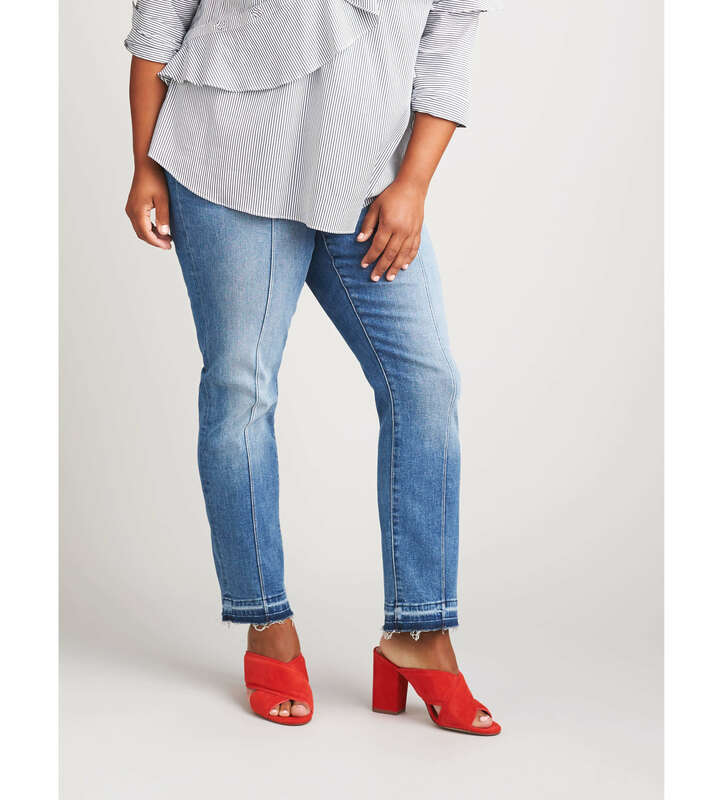 High rise jeans are pure magic when it comes to flattering almost every figure since they sit right at the natural waist (the narrowest point for hourglass shapes). High-waisted, slim leg openings and dark wash pair of jeans are our number one pick for hourglass shapes. It’s all about balance in life and your jeans. If balancing your curves is your objective, try a wide leg or flare jean to elongate your leg line and lend more proportion to your lower half. Whether straight and structured, slim and high-waisted, give your jeans a leg up with trendy details like embroidery, distressing and even embellishments and raw hems. Now it’s time to go and find your perfect pair! As you hunt (or if you ask your Stylist for a new pair), keep these three tips in mind.